The AuthProxy plugin in combination with the Logon plugin handles authentication challenges both in the regular WebView on iOS, the WebView on Android and in Android Crosswalk. It will automatically handle basic authentication and display a certificate selection dialog for X 509 certificate challenges. It stores previously entered credentials in the Logon plugin’s secure data vault and will use those when requests for credentials occur in the future. When an app needs to provide a certificate to the server to identify itself this is known as client authentication or mutual authentication. An example of this is if you are required to provide a client certificate as part of the onboarding process to register with an application or perhaps to access an OData provider (not needed to complete the example). This occurs mostly in Business to Business (B2B) applications. This is different from most business to consumer or B2C websites where it is only the server that authenticates itself to the client with a certificate that has been signed by a certificate authority (CA) such as an online banking site. 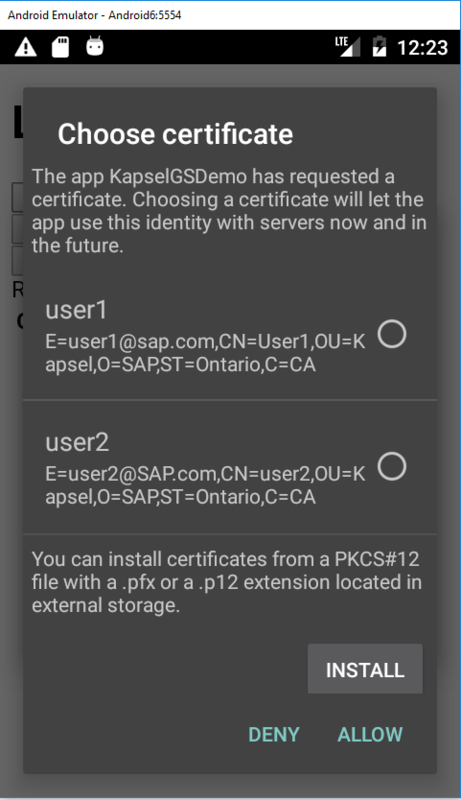 For additional details on the AuthProxy plugin see C:\SAP\MobileSDK3\KapselSDK\docs\api\sap.AuthProxy.html or Using the AuthProxy Plugin. The following steps will demonstrate what happens when a request is sent that does not contain credentials or contains incorrect ones to a backend OData endpoint and how this behavior can be improved with the AuthProxy plugin. Note that the AuthProxy plugin only handles basic authentication challenges and not form based challenges. Handling of form based challenges may be a new feature of the Fiori Client in SP 15. Modify the sample from the Logon Plugin section. In index.html, add the following buttons below the Unlock button. Also add the following two methods. Edit C:\Kapsel_Projects\LogonDemo\config.xml and add the following setting. The below settings when set to false disables the handling of authentication challenges by the AuthProxy plugin. Note that there is a method that can change the stored password called sap.Logon.changePassword(). This is not really needed though as when 401 authentication challenge occurs and the user enters the correct credentials they are then saved. Also note that the sap.Logon.changePassword does not work if the Logon plugin was initialized with sap.Logon.initPasscodeManager. Remove the Push and Settings plugins if present. Prepare, build and deploy the project. Click on Read. Notice that the data is returned. Now exit and remove the app from memory. Open it again and press the Read button. Notice that the data is not shown and a 401 error message is displayed on Android. On iOS, the read call fails silently. Removing the app from memory clears any session cookies. When a request is successfully made to the SMP server such as a registration, a temporary session is established via a session cookie and subsequent requests do not need to send credentials until the session has expired. 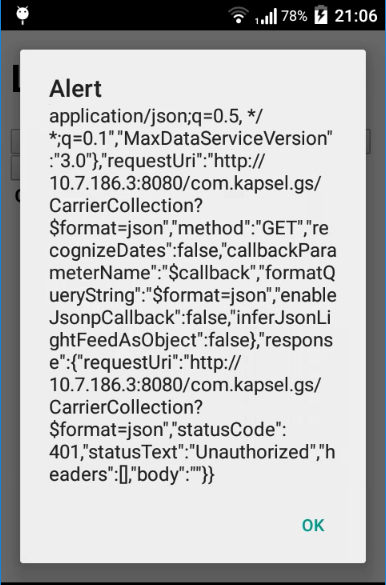 Modify the config.xml file and set SAPKapselHandleBasicAuthChallenges and SAPKapselHandleHttpRequests to true. Click on the Change Password button and change the password to be incorrect. Remove the app from memory (to clear the session cookies) and restart it. Press the Read button. Notice that there is now a prompt for credentials. After seeing that the data appears, exit the app, remove it from memory, restart it, and then click the Read button. Notice that the read succeeds again without having to enter credentials as the HandleBasicAuth and HandleHttpRequests settings were set to true. Note in versions less than SP 15, the page is reloaded after changing credentials. On Android, modify the config.xml and set SAPKapselHandleX509Challenges to true. 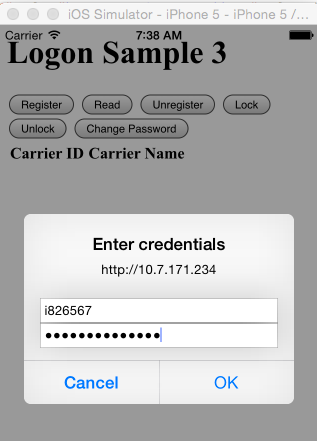 Note this example does not work on iOS as an iOS app can only view certificates that are stored in the app’s keychain. For further details see Making Certificates and Keys Available To Your App. In index.html, comment out sap.Logon.init and uncomment sap.Logon.initPasscodeManager. Also comment out sap.Logon.core.deleteRegistration and uncomment sap.Logon.deletePasscodeManager. Delete the app and redeploy it. 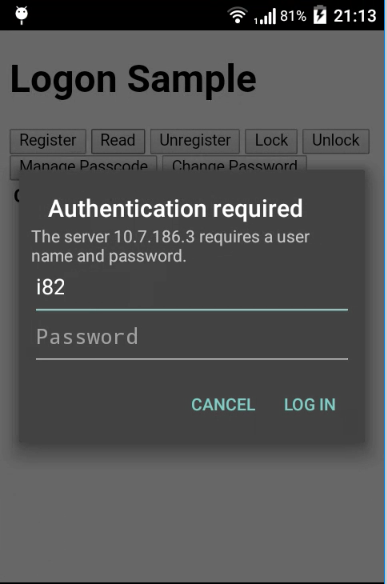 Notice that this time when a read request is made, a dialog is shown asking the user to select an X 509 certificate to log on with. This occurs because in this case we are not proxying the OData connection through the SMP or HCPms server and the backend https://sapes4.sapdevcenter.com/sap/opu/odata/IWFND/RMTSAMPLEFLIGHT allows for authentication using a client cert or a user name and password. 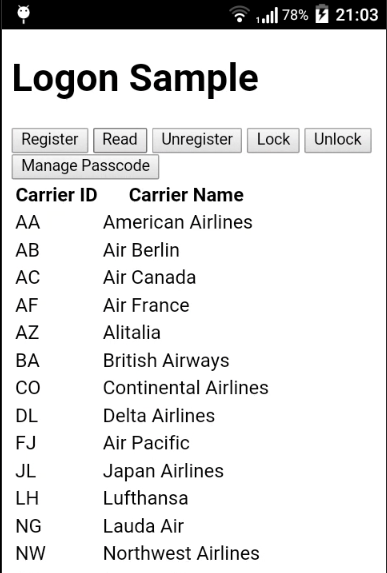 Client certs can be installed on an Android device by pressing Install. The certs would first need to be placed on the device. One command to do so is shown below. The client cert if one exists there could be exported from Chrome under Settings > HTTPS/SSL > Manage certificates > Personal (Certificate intended purposes = Client Authentication) or could be provided by your companies security department. After selecting a cert and choosing allow, if the Clear Certs button is pressed followed by the Read button, the cert selection screen is shown again rather than reusing the previously selected cert.